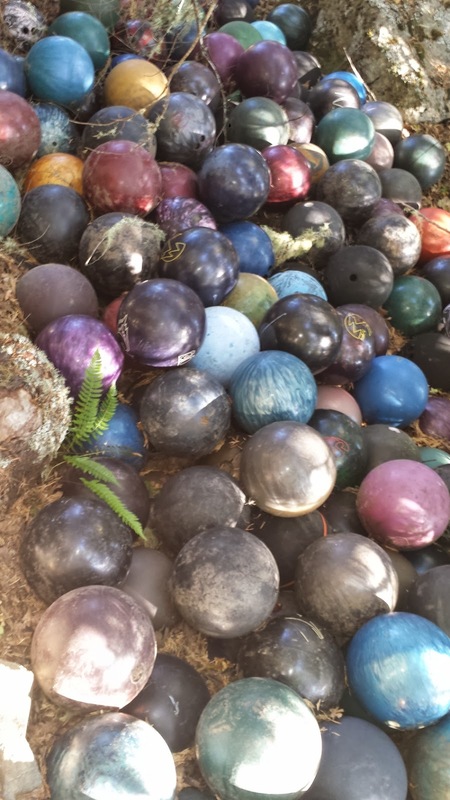 There is a reason that you can't find any used bowling balls in Oregon, and I'm going to tell you what it is. Under a secluded tree, somewhere in the remote countryside, sit four hundred and thirteen -- wait, no, make that four hundred and fifteen, because she just bought out the local thrift store -- gathered bowling balls. I watch as the artist places the new ones. It's a very large, very colorful gathering. What, I ask, are they doing here? "Aging!" she tells me, delightedly. Except for the ones that are used for Wilderness Bowling, she adds. That's a new sport you've never heard of that, no, I'm not making up. I wish I was. These balls have to prove they have what it takes before she applies them to the task she envisions. Because, perhaps like many of the rest of us, some will crack under the strain of this wilderness experience. She has to be sure she knows what each one is made of. And some do crack. She knows exactly what those ones are made of. Rubber and some very hard materials. The cracked ones look like large Easter malted milk balls someone has broken open. The survivors have to stay intact for a good year -- or two, or three -- as long as it takes for her to collect the rest, and put them all together into -- well. That I can't tell you. Because I don't know. This I can tell you: she's still looking. Because, she tells me, to compete her vision she still needs, oh, at least another four hundred. The mind boggles. This one does, anyway. So if you happen to have extra bowling balls lying around, let me know and I'll put you in touch with the artist. Then you can be a patron of the wilderness arts. Or a contributer to a new sport. And if you, too, have been searching for used bowling balls and can't find them, at least you have that mystery solved. Thanks for the concern, but the tree seems to be doing just fine. From what I can tell, trees are pretty good at handling weight on their roots. They grow under, around (and into) boulders regularly. I suspect they can handle the occasional collection of bowling balls.